Men of the 2nd Battalion, 16th Infantry Regiment of the U.S. 1st Infantry Division march through the Kasserine Pass and on to Kasserine and Farriana, Tunisia February 26, 1943. The Axis forces, led by Generalfeldmarschall Erwin Rommel, were primarily from the Afrika Korps Assault Group, elements of the Italian Centauro Armoured Division and two Panzer divisions detached from the 5th Panzer Army, while the Allied forces consisted of the U.S. II Corps (Major General Lloyd Fredendall), the British 6th Armoured Division (Major-General Charles Keightley) and other parts of the First Army (Lieutenant-General Kenneth Anderson). The battle was the first major engagement between American and Axis forces in World War II in Africa. Inexperienced and poorly led American troops suffered many casualties and were quickly pushed back over 50 miles (80 km) from their positions west of Faïd Pass. This result confirmed a prediction of Winston Churchill, who had strongly advocated that the invasion of France as laid out in the proposed 1942 plan Operation Roundup be delayed until the Allies could support such an ambitious undertaking, which would give the American troops time to get up to speed with the realities of war against the experienced and well-equipped Italians and Germans. 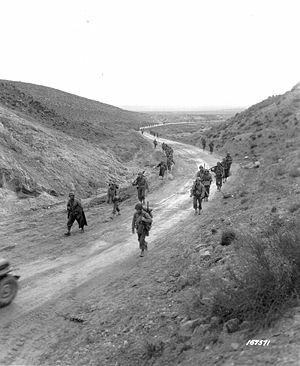 After the early defeat, elements of the U.S. II Corps, with British reinforcements, rallied and held the exits through mountain passes in western Tunisia, defeating the Axis offensive. As a result of the battle, the U.S. Army instituted sweeping changes of unit organization and replaced commanders and some types of equipment. American and British forces landed at several points along the coast of French Morocco and Algeria on November 8, 1942, during Operation Torch. This came only days after the breakthrough of the British Eighth Army (Lieutenant-General Bernard Montgomery) following the Second Battle of El Alamein. In response, German and Italian troops were ferried in from Sicily to occupy Tunisia, one of the few easily defended areas of North Africa and only one night's sail from bases in Sicily. This short passage made it very difficult for Allied naval vessels to intercept Axis transports, while air interdiction proved equally difficult as the nearest Allied airbase to Tunisia, at Malta, was over 200 mi (320 km) distant. 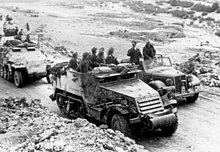 The Run for Tunis in November and December 1942 is the term for an attempt to reach Tunis before German and Italian reinforcements could arrive. 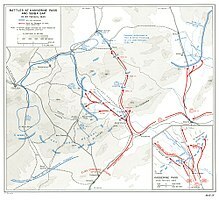 Because of the poor road and rail communications, only a small, division-sized Allied force could be supplied, and, in the excellent defensive terrain, small numbers of German and Italian troops were sufficient to defeat the attempt. The Allied build-up continued, more aircraft became available and new airfields in eastern Algeria and Tunisia were built. The Allies reduced the flow of Axis troops and equipment into Tunis and Bizerta, but a sizeable Axis force was already ashore. Allied troops had already crossed the Atlas Mountains and had set up a forward base at Faïd, in the foothills on the eastern arm of the mountains, an excellent position to thrust east to the coast, split the Axis forces in southern Tunisia from the forces further north, and cut the line of supply to Tunis. It was murder. They rolled right into the muzzles of the concealed eighty-eights and all I could do was stand by and watch tank after tank blown to bits or burst into flames or just stop, wrecked. Those in the rear tried to turn back but the eighty-eights seemed to be everywhere. The 21st Panzer Division resumed its advance towards Faïd. American infantry casualties were exacerbated by the practice of digging shallow shell scrapes instead of foxholes, as German tank drivers could easily crush a man inside a scrape by driving into it and simultaneously making a half-turn. Several attempts were made by the 1st Armored Division to stop the German advance, but all three combat commands found that each defensive position they tried to occupy had already been overrun, and they were attacked by German troops with heavy losses. On 2 February, the 1st Armored Division was ordered to end its attacks and concentrate to form a reserve. The Germans captured most of Tunisia, and the entrances into the coastal lowlands were blocked. The Allies held the interior of the roughly triangular Atlas range, but with the exits blocked this was of little advantage to the Allies. For the next two weeks, Rommel and the Axis commanders further north debated what to do next. Rommel did not consider the Eighth Army a serious threat, because until Tripoli was open, Montgomery could maintain only a small force in south Tunisia. Ships commenced unloading on February 9, but the port was not fully operational until the end of the month. Rommel made a proposal in early February to Comando Supremo (Italian High Command in Rome), to attack with two battlegroups, including detachments from the 5th Panzer Army, toward two U.S. supply bases just to the west of the western arm of the mountains in Algeria. A quick thrust could capture the supplies and disrupt a U.S. attempt to concentrate forces near Tebessa. Arnim objected, and the attack was delayed for a week until agreement was reached to mount Operation Frühlingswind, a thrust by the 5th Panzer Army through the U.S. communications and supply center of Sidi Bou Zid. Rommel's forces, 60 miles (97 km) to the south-west, would conduct Operation Morgenluft to capture Gafsa and advance on Tozeur. On February 14, the 10th and 21st Panzer divisions began the Battle of Sidi Bou Zid, about 10 mi (16 km) west of Faïd, in the interior plain of the Atlas Mountains. The U.S. tanks were defeated, and the infantry, poorly sited on three hills and unable to give mutual support, was isolated. A counterattack the next day was easily repulsed, and on February 16 the Germans advanced towards Sbeitla. After the success at Sidi Bou Zid, Rommel ordered the Afrika Korps Assault Group to attack Gafsa on February 15, but, on the night before, Anderson ordered the defenders to evacuate Gafsa and make the main defence line the hills around Feriana, as he believed Gafsa should not be defended against a large attack. The next day, because of the threat to the southern flank, Anderson obtained Eisenhower's agreement and ordered a withdrawal from the Eastern Dorsale, to the line of the Western Dorsale from Feriana northwards. Early on February 17, Fredendall ordered a withdrawal from Sbeitla and Feriana. The U.S. II Corps was able to concentrate at the Kasserine and Sbiba Passes, on the western arm of the mountains. U.S. casualties were 2,546 men, 103 tanks, 280 vehicles, 18 field guns, three anti-tank guns and an anti-aircraft battery. At this point, there was some argument in the Axis camp about what to do next; all of Tunisia was under Axis control, and there was little to do until the Eighth Army arrived at Mareth. 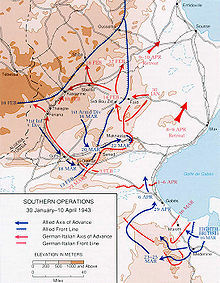 Rommel decided to attack through the Kasserine Pass into the main force of the U.S. II Corps at Tébessa to capture U.S. supplies on the Algerian side of the western arm of the mountains, eliminate the Allied ability to attack the coastal corridor linking Mareth and Tunis and threaten the southern flank of the First Army. On February 18, Rommel submitted his proposals to Albert Kesselring, who forwarded them with his blessing to the Comando Supremo in Rome. At 13:30 on February 19, Rommel received the Comando Supremo's agreement to a revised plan. He was to have 10th and 21st Panzer Divisions transferred from Arnim's 5th Panzer Army to his command and attack through the Kasserine and Sbiba passes toward Thala and Le Kef to the north, clearing the Western Dorsale and threatening the 1st Army's flank. [b] Rommel was appalled; the plan dispersed Axis forces and, through the passes, would expose their flanks. A concentrated attack on Tébessa, while entailing some risk, could yield badly needed supplies, destroy Allied potential for operations into central Tunisia and capture the airfield at Youks-les-Bains, west of Tébessa. In the early hours of February 19, Rommel ordered the Afrika Korps Assault Group from Feriana to attack the Kasserine Pass. The 21st Panzer Division at Sbeitla was ordered to attack northward through the pass east of Kasserine which led to Sbiba and Ksour. The Kampfgruppe von Broich, the battlegroup released by Arnim from 10th Panzer Division, was ordered to concentrate at Sbeitla, where it would be ready to exploit success in either pass. The Sbiba area was attacked by Battle Groups Stenkhoff and Schuette, remnants of the 21st Panzer Division. Facing the German armored advance was the British 6th Armoured Division (less the 26th Armoured Brigade which except for the tanks of the 16/5th Lancers had been sent to Thala). Also in the line was the 18th Regimental Combat Team from the U.S. 1st Infantry Division; and three battalions of infantry from U.S. 34th Infantry Division. There were also three U.S. Field Artillery battalions, elements of two British anti-tank regiments and some French detachments. The Germans made little progress against the combined firepower of the defending force which had also laid minefields. The 21st Panzer Division was checked and then driven back by February 20. Defending the pass was a force consisting of the U.S. 1st Battalion, 26th Regimental Combat Team, the U.S. 19th Combat Engineer Regiment, the 6th Field Artillery Battalion, a tank destroyer battalion and a battery of French artillery. On the hills to their west was French General Welvert's Task Force Welvert comprising a U.S. Ranger and infantry battalion, three French infantry battalions, two U.S. field artillery battalions, four French artillery batteries and engineer and anti-aircraft detachments. Furthest west was Task Force Bowen (consisting of the 3rd Battalion of the 26th Regimental Combat Team), blocking the track from Feriana towards Tebessa. Between Task Force Bowen and Tebessa to the north was the regrouping 1st Armored Division although only Combat Command B was fit for combat. The positions in the pass had been placed under Colonel Alexander Stark, commander of the 26th RCT, on the night of February 18 and the command named Stark Force. An attempt to surprise the Kasserine defenses by the 33rd Reconnaissance Unit into the pass failed and a battalion of Panzer grenadiers was ordered into the floor of the pass and another onto Djebel Semmama, the hill on its eastern flank and slow progress was made against artillery fire. The tanks of 1/8th Panzer Regiment were committed at noon but little further progress resulted against stubborn defense. Rommel decided to commit his units from the 10th Panzer to the Kasserine Pass the next morning in a coordinated attack with the Afrika Korps Assault Group, which was to be joined by elements of the Italian 131st Armored Division Centauro. British reinforcements from the 26th Armoured Brigade (6th Armoured Division) had been assembling at Thala and Brigadier Dunphie, making forward reconnaissance, decided to intervene. The First Army headquarters restricted him to sending Gore Force, a small combined-arms group of a company of infantry, a squadron of 11 tanks, an artillery battery and an anti-tank troop. Brigadier Cameron Nicholson (6th Armoured Division) was given command of Nickforce, all units north-west of the pass. During the night, the American positions on the two shoulders overlooking the pass were overrun and at 8:30 am German panzer grenadiers and Italian Bersaglieri resumed the attack. At 10.00 am Dunphie judged that Stark Force was about to give way and ordered Gore Force to the Thala side of the pass as elements of the Centauro Division launched their attack towards Tebessa and continued it during the afternoon. At 1:00 pm Rommel committed two battalions from 10th Panzer which overcame the defense. Tanks and Bersaglieri from the Centauro Division advanced along Highway 13 and overran the 19th Combat Engineer Regiment. The U.S. survivors made a disorganized retreat up the western exit from the pass to Djebel el Hamra, where Combat Command B of the 1st Armored Division was arriving. On the exit to Thala, Gore Force slowly leapfrogged back, losing all its tanks in the process, to rejoin the 26th Armoured Brigade some 10 miles (16 km) further back. The Afrika Korps Assault Group began moving along the Hatab River valley towards Haidra and Tebessa in the early afternoon of February 21 and advanced until they met defenders consisting of the U.S. 16th Infantry Regiment, 1st Infantry Division and Combat Command B of the U.S. 1st Armored Division at Djebel el Hamra. The German–Italian force was halted and despite heavy pressure, including air attacks, failed to dislodge the American defenders. Having brought the Axis drive towards Tebessa to a halt, General Paul Robinett and General Terry Allen now turned their attention to planning a counterattack that was to take place the next day, February 22. Plans made by both sides were upset by the battle, and the Axis forces (5 Bersaglieri, a Semovente group from Centauro and 15 Panzer) launched another assault on the U.S. position on the morning of the 22 February. Although the American defenders were pressed hard, the line held and by mid-afternoon, the U.S. infantry and tanks launched a counterattack that broke the combined German and Italian force. More than 400 Axis prisoners were taken as the counterattack was pressed into the Afrika Korps position. Rommel had stayed with the main group of the 10th Panzer Division on the route toward Thala, where the 26th Armoured Brigade and remnants of the U.S. 26th Infantry Regiment had dug in on ridges. If the town fell and the southern of two roads from Thala to Tebessa was cut, the U.S. 9th Infantry Division to the north would be cut off and Combat Command B of the 1st Armored Division would be trapped between the 10th Panzer Division and its supporting units moving north along the second road to Tebessa. The combined force fought a costly delaying action in front of Thala, retreating ridge by ridge to the north until by dark, the force held the German attacks just south of the town. The divisional artillery (48 guns) of the 9th Infantry Division and anti-tank platoons, that had moved from Morocco on February 17, 800 mi (1,300 km) west, dug in that night. Next day, the front was held mostly by British infantry, with exceptionally strong backing by unified U.S. and British artillery, under Brigadier General Stafford LeRoy Irwin, the U.S. artillery commander. The British had 36 guns, supported by tanks of the Derbyshire Yeomanry and the 17th/21st Lancers. Anderson ordered the 9th Infantry Division and its artillery support to Le Kef to meet an expected German attack but U.S. Major General Ernest N. Harmon, who had been sent by Eisenhower to report on the battle and the Allied command, instructed the 9th divisional artillery to stay behind. On the morning of February 22, an intense artillery barrage from the massed Allied guns forestalled the resumption of the 10th Panzer Division attack, destroying armour and vehicles and disrupting communications. Broich, the battle group commander, decided to pause and regroup but Allied reinforcements continued to arrive. Under constant fire, 10th Panzer waited until dark to retire from the battlefield. Overextended and with supplies dwindling, pinned down by the Allied artillery in the pass in front of Thala and now facing U.S. counterattacks along the Hatab River, Rommel realized his attack had been stopped. At Sbiba, along the Hatab River and now at Thala, the efforts of the German and Italian forces had failed to make a decisive break in the Allied line. With little prospect of further success, Rommel judged that it would be wiser to break off to concentrate in South Tunisia and strike a blow at the Eighth Army, catching them off balance while still assembling its forces. He at least had the consolations that he had inflicted heavy losses on his enemy and that the Allied concentrations in the Gafsa – Sbeitla area had been destroyed. At a meeting at Rommel's Kasserine HQ on February 23, Kesselring and his Chief of Staff Siegfried Westphal tried to change Rommel's mind, arguing that there were still possibilities for success. Rommel was adamant; Kesselring finally agreed and formal orders from the Comando Supremo in Rome were issued that evening calling off the offensive and directing all Axis units to return to their start positions. On February 23 a massive U.S. air attack on the pass hastened the German retreat and by late on February 24, the pass had been reoccupied, Feriana was in Allied hands; Sidi Bou Zid and Sbeitla followed soon after. Rommel in Tunisia speaking with troops riding a captured American built M3 Half-track. Rommel had hoped to take advantage of the inexperience of the new Allied commanders but was opposed by Arnim who, wanting to conserve strength in his sector, ignored Kesselring's orders and withheld the attached heavy tank unit of 10th Panzer. Rommel felt that most U.S. units and commanders showed their inexperience, losing sight of the broader picture. Rommel was unable to exploit Allied failings due to a lack of forces and freedom of maneuver and the opportunity was missed, but he praised the 2nd Battalion, 13th Armored Regiment of the 1st Armored Division in its defense of Sbeitla for being "clever and well fought". [page needed] Rommel was later impressed with how quickly U.S. commanders came to understand and implement mobile warfare and also praised U.S. equipment: "British experience has been put to good use in American equipment". Of particular interest to the Germans was the sturdy M3 armored half track, and for some time after the battle, German units deployed large numbers of captured U.S. vehicles. The Allies studied the results equally seriously. Positioned by senior commanders who had not personally reconnoitred the ground, U.S. forces were often located too far from each other for mutual support. It was also noted that American soldiers tended to become careless about digging in, exposing their positions, bunching in groups when in open view of enemy artillery observers, and positioning units on topographic crests, where their silhouettes made them perfect targets. Too many soldiers, exasperated by the rocky soil of Tunisia, were still digging shallow slit trenches instead of deep foxholes. The 1st Armored Division was on the receiving end of German anti-tank and screening tactics and had not learned about those tactics from experienced British armored forces. Others in the U.S. Army were well aware of the German deception tactics. The Allies were also unable to prevent the Germans from attaining air superiority over the battlefield, limiting effective Allied air reconnaissance and allowing relentless German bombing and strafing attacks that disrupted Allied attempts at deployment and organization. Attacks by the Luftwaffe in close support of German ground offensives often neutralized American attempts to organize effective defensive artillery fire. General Dwight D. Eisenhower began restructuring the Allied command, creating the 18th Army Group, commanded by General Sir Harold R. L. G. Alexander, to tighten the operational control of the three Allied nations involved and improve their coordination. Major General Lloyd Fredendall was relieved by Eisenhower and sent home. Training programmes at home had contributed to U.S. Army units in North Africa being saddled with disgraced commanders who had failed in battle and were reluctant to advocate radical changes. Eisenhower found through Major General Omar Bradley and others, that Fredendall's subordinates had lost confidence in him and Alexander told U.S. commanders, "I'm sure you must have better men than that". On March 6, Major General George Patton was temporarily removed from planning for the Allied invasion of Sicily to command the II Corps. Bradley was appointed assistant corps commander and moved up to command of II Corps when Patton returned to planning for Sicily. Fredendall was reassigned to the United States and several other commanders were removed or promoted out of the way. Patton was not known for hesitancy and did not bother to request permission when taking action to support his command or other units requesting assistance. During the advance from Gafsa, Alexander, the 18th Army Group commander, had given detailed orders to Patton, afterwards changing II Corps' mission several times. Once beyond Maknassy, Alexander again gave orders Patton considered excessively detailed. From then on, Patton simply ignored those parts of mission orders he considered ill-advised on grounds of military expediency and/or a rapidly evolving tactical situation. Efforts were made to improve the integration of immediate artillery and air support, which had been poorly coordinated. While U.S. artillery response times improved dramatically, coordinating close air support was not achieved until Operation Overlord over a year later. American anti-aircraft artillery began reforms, having learned that, while Stuka dive bombers were vulnerable to .50 BMG rounds fired from vehicles, field units needed dedicated autocannon to protect them from aerial attack: in one division, 95 percent of air attacks were concentrated on its artillery. Emphasis was also placed on keeping units concentrated rather than using combat commands independently. II Corps began to use divisions as divisions and by the invasion of Sicily, their forces were considerably stronger. ^ Poorly equipped and supplied with World War I era light artillery and ammunition, including outmoded shrapnel rounds, the French were nonetheless expert artillerymen and occasionally hammered German patrols and infantry attempting to negotiate the narrow passes. ^ Arnim only released a battlegroup under Felix von Broich. ^ Harmon reported that Ward was "hopping mad" at Anderson for dispersing his division and at Fredendall for allowing it. ^ a b c d e Rottmann, p. 74. ^ Heller, Charles. America's First Battles, 1776–1965. 1986. University Press of Kansas. ISBN 0-7006-0277-1. p. 261. ^ "Historia de las Fuerzas Armadas alemanas. Kasserine 1943". Portal Militar y Panzertruppen (in Spanish). Columbia. Archived from the original on February 12, 2008. Retrieved January 19, 2008. ^ a b c d Hickman, Kennedy. "World War II: Battle of Kasserine Pass – North Africa". Militaryhistory.about.com. Retrieved 2016-07-31. ^ a b Playfair et al. 2004, p. 204. ^ Playfair et al. 2004, p. 210. ^ Playfair et al. 2004, p. 229. ^ Playfair et al. 2004, p. 293. ^ Atkinson 2002, p. 372. ^ Playfair et al. 2004, pp. 297–298. ^ Watson (2007), pp. 109–110. ^ Playfair et al. 2004, pp. 282, 386. ^ Playfair et al. 2004, p. 377. Anderson, Lt.-General Kenneth (1946). Official despatch by Kenneth Anderson, GOC-in-C First Army covering events in NW Africa, November 8, 1942 – May 13, 1943 published in "No. 37779". The London Gazette (Supplement). November 5, 1946. pp. 5449–5464. Atkinson, Rick (2002). An Army at Dawn: The War in North Africa, 1942–1943. New York: Henry Holt and Company. ISBN 0-8050-6288-2. D'Este, Carlo (2003). Eisenhower: A Soldier's Life. Orion. ISBN 0-304-36658-7. Hamilton, John. "Kasserine Pass" (PDF). Air Defense Artillery journal (April–June 2005). Archived from the original (PDF) on March 31, 2012. Hoffmann, Peter (2003). Stauffenberg: A Family History, 1905–1944. Montreal: McGill-Queen's University Press. ISBN 0-7735-2595-5. Lewin, Ronald (2004) . Rommel as Military Commander. Barnsley, South Yorkshire: Pen & Sword. ISBN 1-84415-040-2. Murphy, Brian John. "Facing the Fox". America in WWII Magazine (April 2006): 28–35. Archived from the original on September 28, 2007. Retrieved December 23, 2007. Playfair, Major-General I. S. O.; and Molony, Brigadier C. J. C.; with Flynn R.N., Captain F. C. & Gleave, Group Captain T. P. (2004) [HMSO 1966]. Butler, J. R. M., ed. The Mediterranean and Middle East: The Destruction of the Axis Forces in Africa. History of the Second World War United Kingdom Military Series. IV. Uckfield, UK: Naval & Military Press. ISBN 1-84574-068-8. Rottmann, Gordon (2008). M3 Medium Tank vs Panzer III – Kasserine Pass 1943. Osprey Publishing. ISBN 1-84603-261-X. Rutherford, Ward (1971). Kasserine, Baptism of Fire. London: MacDonald and Co. ISBN 0-345-02098-7. OCLC 104309. Semmens, Paul. "THE HAMMER OF HELL: The Coming of Age of Antiaircraft Artillery in WW II". Air Defense Artillery Magazine. Zaloga, Steven (2005). Kasserine Pass 1943 – Rommel's Last Victory. Oxford: Osprey. ISBN 1-84176-914-2. OCLC 60793211. Howe, G. F. (1957). Northwest Africa: Seizing the Initiative in the West. United States Army in World War II: Mediterranean Theatre of Operations (1991 ed.). Washington, DC: Department of the Army. ISBN 0-16-001911-7. OCLC 23304011. Retrieved 2 June 2015. 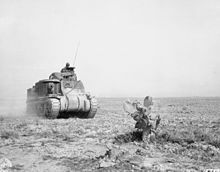 "Battle for Kasserine Pass: 1st Armored Division Were Ambushed by the Afrika Corps at Sidi Bou Zid". World War II Magazine. Weider History Group (September 2002). Retrieved February 12, 2012.